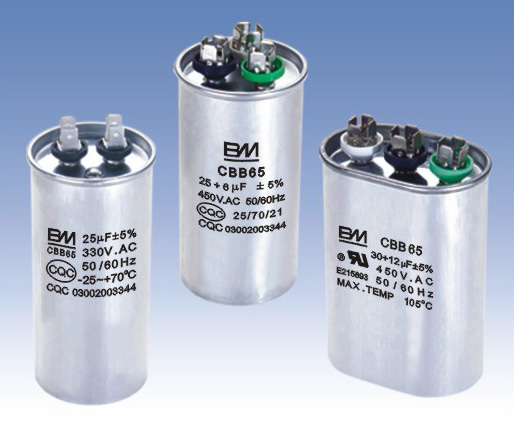 Dry A.C capacitors are used for A.C motor's starting and running, it is small cubage,light weight,low dissipation factor, low temperature rise, high insulation, fine self-healing property. We can make the A.C capcitors with safety rupture proof device in ROHS testing according to clients' requirement. 3).The install part is screw at bottom of container or decided by clients. 4).Connection terminals: 250# terminal, plastic-sealed wire, etc. This type of capacitors are suit for AC motor's starting and running at 50HZ/60HZ,Used widely in air compressor, washing machine, air conditioner, etc.Can be also used in UPS,apparatus, and meter for save energy and filter water,etc. functions. The install part is screw at bottom of container or decided by clients. Connection terminals: 250# terminal, plastic-sealed wire, etc.